Elizabeth Schmidt’s earlier work, Foreign Intervention in Africa (Cambridge, 2013, https://amzn.to/2G4Tu7L), focused on the period 1945–91, with a brief concluding chapter on 1991– 2010. This companion volume focuses on 1991–2017, with a final chapter highlighting the potential impact of the Trump presidency. Schmidt’s approach in the two volumes is similar. Her aim is not to provide a comprehensive narrative or advance an explanatory theory, but to introduce a series of case studies, taking into account global narratives and common factors as well as the particularity and nuances of each case. In the post–Cold War period examined in this book, Schmidt identifies two distinct paradigms applied by policy makers. A specific intervention might fall primarily under the paradigm of a response to instability, some cases of which might also fit under the newly defined multilateral rubric of the "responsibility to protect." Alternatively, it might fit within the framework of the "war on terror." Or, as in the case of Somalia, both paradigms might be at work simultaneously. Characteristically, "war on terror" interventions were often counterproductive, increasing rather than decreasing the impact of movements defined as terrorist threats. Globally, these interventions were driven particularly by the United States, with accelerated militarization in Africa as well as around the world in the period following the 2001 terrorist attacks on the World Trade Center and the Pentagon. During the first post–Cold War decade, foreign intervention assumed a new character. Many Western nations that had been implicated in African conflicts during the Cold War turned their attention elsewhere. The United States, as the self-proclaimed Cold War victor, showed little interest in direct military intervention, and its economic assistance programs were severely reduced. However, in keeping with its call for African solutions to Africa problems, Washington initiated new programs to bolster African military capabilities and others that focused on free market economic development and trade. Recognizing that African’s enormous external debts, often incurred by Cold War clients, and the HIV/AIDS pandemic contributed to political and economic instability, the United States also introduced programs to address these problems. The policy shift meant that most military interventions during the 1990s were conducted by African countries—sometimes to reestablish regional peace and security, at others to support proxy forces that granted access to their neighbors’ resources. Although extracontinental powers were less likely to intervene unilaterally during the 1990s, multilateral intervention by both extracontinental and African powers intensified and took shape under new auspices. The UN, OAU, and various subregional bodies intervened in response to instability—to broker, monitor, and enforce peace accords and to facilitate humanitarian relief operations. Peacekeeping and humanitarian interventions were viewed positively by many African constituencies, although disparities in power meant that African agents had little authority over external forces once implanted on African soil. In a striking deviation from Cold War trends, the international community was sometimes castigated for not acting quickly or boldly enough—as in the case of the Rwandan genocide in 1994, the Liberian civil war that ended in 2003, and the Darfur conflict in Sudan that began in 2003. The UN Security Council, in particular, was reproached for its refusal to thwart the Rwandan genocide and to act more forcefully in Darfur. Under pressure from human rights and humanitarian lobbies and from African civil societies, the UN General Assembly passed a resolution in 2005 that held countries responsible for protecting their citizens from “genocide, war crimes, ethnic cleansing and crimes against humanity” and granted the international community the right to intervene through UN Security Council-sanctioned operations if governments failed to fulfill their “responsibility to protect” (R2P). 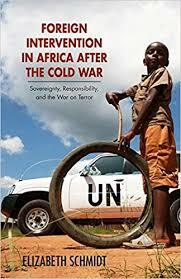 The political, economic, and social upheavals that characterized the late Cold War and early post–Cold War periods resulted in severe instability in numerous African states and regions. Foreign powers and multilateral institutions took note when domestic turmoil was perceived to jeopardize international peace and security. In most instances, their involvement entailed brokering, monitoring, and enforcing peace agreements. Diplomatic and military interventions were often justified on the grounds that outside actors had both the right and the responsibility to guarantee international peace and security if individual states failed to do so. In such cases, intervention was authorized according to Chapters VI, VII, or VIII of the 1945 UN Charter. In instances where large civilian populations were at risk and refugee flows heightened regional tensions, the response to instability was bolstered by newer claims that the international community had a responsibility to protect civilian lives. In such cases, intervention was justified by a 2005 UN General Assembly resolution that bestowed on the international community the responsibility to protect civilians when their governments were unable or unwilling to do so. Post–Cold War intervention in African affairs has been characterized not only by the increased involvement of multinational bodies, but also by changing notions concerning the right to intervene. Since the mid-1990s, when the international community largely ignored appeals to thwart the Rwandan genocide, growing constituencies in Africa and in the West have called for humanitarian interventions to end human rights abuses and to protect civilians, with or without the consent of the states in question. Such interventions might include military force, sanctions, or the forcible delivery of humanitarian aid. Although the notion of humanitarian intervention has gained support, it remains controversial. External interference in a state’s domestic affairs challenges a premise of international law that has held sway for more than three and a half centuries. The mass exterminations of European Jews and other populations during World War II challenged the principles of international law that had allowed such crimes to occur, and the impunity of national leaders was called into question. The Nuremberg trials (1945–1949), which held key individuals in Nazi Germany’s political, economic, and military establishment accountable for war crimes and crimes against humanity, paved the way for increased scrutiny of national leaders. The postwar order witnessed an expansion of democratic values and institutions. Universal principles of human rights were enshrined in the International Bill of Human Rights comprising the Universal Declaration of Human Rights (1948), the International Covenant on Civil and Political Rights (1966), and the International Covenant on Economic, Social, and Cultural Rights (1966). In 1948, the UN General Assembly adopted the Convention on the Prevention and Punishment of the Crime of Genocide (the Genocide Convention), which required member nations “to prevent and to punish” genocide wherever and whenever it is found. Emergent human rights and humanitarian movements gave primacy to individual over states’ rights and emphasized the protection of minorities and other vulnerable members of society. National laws were no longer off limits for international investigation. Subject peoples in Europe’s African and Asian empires embraced universal human rights claims and demanded equal treatment under the law and national selfdetermination. In the 1950s and 1960s, their efforts culminated in widespread decolonization. The end of the Cold War brought additional challenges to the state sovereignty principle. The Soviet Union had disintegrated, and the United States and other Western powers no longer felt the same need for strongmen to protect their interests. Newly critical of their clients’ corrupt practices and human rights abuses, they withdrew their support from longstanding dictators and called for accountability in governance. These momentous political shifts provided opportunities for new ways of thinking, and a cadre of public intellectuals in the Global North and South began to argue for a fundamental reconceptualization of the premises of state sovereignty, one that harkened back to the social contract that sometimes had confounded sovereigns’ ability to wield their power with impunity. These thinkers charged that to legitimately claim sovereignty, a state must provide basic conditions for the well-being of its citizenry, including not only peace, security, and order, but also adequate food, clean water, clothing, shelter, healthcare, education, and employment. In some polities, dominant groups target populations whose race, ethnicity, or religion differs from those of those in power. In some cases, the state not only fails to protect vulnerable populations from gross human rights violations, ethnic cleansing, or genocide, but is complicit in perpetrating those crimes. According to the new paradigm, a state that is unable or unwilling to fulfill its foundational responsibilities forfeits the right to sovereignty over its territory and people—and its exemption from outside interference. It was in this new context that the UN moved toward a broader definition of international responsibility for the protection of human rights. In June 1993, governmental and nongovernmental representatives from 171 nations met at the UN-sponsored World Conference on Human Rights in Vienna, where they endorsed the claim that “All human rights are universal, indivisible and interdependent and interrelated….While the significance of national and regional particularities and various historical, cultural and religious backgrounds must be borne in mind, it is the duty of States, regardless of their political, economic and cultural systems, to promote and protect all human rights and fundamental freedoms.” In theory, state failure to protect its citizens could warrant UN intervention. After the Cold War, the disintegration of the Soviet Union, the splintering of states in Eastern Europe and Central Asia, and challenges to others elsewhere produced millions of refugees and spawned untold numbers of armed insurgents who crossed borders and fomented instability. Because the UN’s purpose is “to maintain international peace and security,” and because massive human rights violations have ripple effects that affect entire regions, rectifying such wrongs increasingly was understood to be within the UN’s purview. However, UN actions did not keep pace with the expanded understanding of the organization’s jurisdiction. Prioritizing their own domestic and foreign policy agendas, permanent members of the Security Council opposed measures that might have thwarted the genocide in Rwanda in 1994 and ethnic cleansing in Sudan’s Darfur region in 2003–2004. Continued pressure from nongovernmental organizations and human rights activists pushed the UN General Assembly to pass the 2005 resolution that held countries accountable for protecting their citizens from “genocide, war crimes, ethnic cleansing and crimes against humanity” and granted the international community the right to intervene through UN Security Council–sanctioned operations if governments failed to fulfill their “responsibility to protect.” Supported by 150 countries, the R2P resolution upended an understanding of state sovereignty that had been one of the fundamental tenets of international law since the seventeenth century. In theory, deference to “state sovereignty” no longer could be used as an expedient to allow ethnic cleansing, genocide, or other crimes against humanity to proceed unhindered. As calls for multilateral diplomacy evolved into appeals for military intervention under the mantle of responsibility to protect, there was sharp disagreement over the motives of those intervening, the means they employed, and whether the outcomes provided increased protection or insecurity for the civilian populations at issue. Some governments reacted to international scrutiny by invoking the old principle of national sovereignty. Others charged that international human rights laws were based on Western capitalist norms that give primacy to the rights of individuals over those of society and thus were not applicable to their cultures or conditions. They argued that Western claims to the universality of their human rights definitions were yet another of example of cultural imperialism and neocolonialism. Still others claimed that humanitarian intervention was simply a guise for Western powers’ pursuit of their own economic or strategic objectives and warned that Western countries were attempting to recolonize the Global South. In countries and regions affected by conflict, governments and citizens were divided on the merits of outside intervention, whether by international organizations, neighboring states, or extracontinental powers. Many remained skeptical of outsiders’ motives and their capacity to bring peace, even when their actions were part of an approved multilateral initiative. If the roots of the first paradigm can be traced to post–World War II reflections on the need for peace, justice, and human rights to ensure a stable international order, the seeds of the second paradigm can be found in the Cold War struggle between capitalism and communism. From the outset, the United States recognized the power of religion as a weapon against its atheistic opponents, and it mobilized conservative religious groups to fight the communist menace. In Europe, it supported Christian parties and organizations that opposed the Italian, Greek, and French communist parties that had gained strength during World War II and its aftermath. In the Middle East, it backed conservative Muslim organizations and regimes that sought to suppress both communism and radical nationalism. When the pro-Western Shah of Iran was overthrown in January 1979 and replaced by militants who embraced the Shi’a branch of Islam, Washington rallied extremists in the rival Sunni branch to counter Iran’s growing prominence. Saudi Arabia, a staunch American ally, promoter of fundamentalist Sunni teachings, and competitor with Iran for regional dominance, joined the United States in its patronage of Sunni militants. Most relevant for this study is the CIA-led multinational coalition that recruited, trained, armed, and financed Sunni militants from all corners of the globe to challenge the decade-long Soviet occupation of Afghanistan (1979–1989). After ousting the Soviets from Afghanistan, the fighters returned home, where they founded new organizations and spearheaded insurgencies, primarily against Muslim states they deemed impious. The Afghan veterans played prominent roles in most of the extremist groups that emerged in Africa and the Middle East in the decades that followed. …. One of the most significant terrorist networks was alQaeda (The Base), which was established from the database of fighters and other volunteers who had passed through Osama bin Ladin’s camps. Founded in 1989 with bin Laden as its primary organizer and patron, al-Qaeda advocated jihad against apostate Muslim regimes and their supporters worldwide. … The United States—bin Laden’s onetime ally—would become an important al-Qaeda target. The First Gulf War also precipitated the 1991 transfer of al-Qaeda’s headquarters and training camps to Sudan, where the organization launched a network of cells and allied organizations that radiated into the Greater Horn—a geographic region that included Burundi, Eritrea, Ethiopia, Djibouti, Kenya, Rwanda, Somalia, Sudan, Tanzania, and Uganda. In May 1996, under pressure from the United States, Saudi Arabia, and the UN Security Council, the Sudanese government asked bin Laden to leave. He moved al-Qaeda’s headquarters back to Afghanistan, where the organization allied with the Taliban. Blaming the United States for his ejection from Sudan, bin Laden focused new attention on this distant enemy. In August 1996, he issued a declaration of jihad against U.S. military forces in Saudi Arabia and called on all Muslims to expel Americans and Israelis from Muslim lands. Al-Qaeda’s September 2001 attacks on the World Trade Center in New York and the Pentagon in Washington, D.C. were preceded by a number of other assaults against American citizens and infrastructure. These included the 1995 World Trade Center bombing and thwarted attacks on New York bridges and tunnels and the UN and Federal Bureau of Investigation (FBI) headquarters; the 1998 bombings of U.S. embassies in Kenya and Tanzania; a failed attempt in 1999 to blow up Los Angeles International Airport; and in 2000, a successful attack on the U.S. Navy destroyer USS Cole, which was docked in Yemen. Although al-Qaeda’s September 2001 attacks on the United States opened a new chapter in the war on terror, the United States had been fighting the terrorist organizations it had helped to create since the mid-1990s. African crises were largely ignored during the first post–Cold War decade. However, the continent returned to the American radar screen after the September 2001 terrorist attacks, and the war on terror became a focal point of U.S.-Africa policy. During the second post–Cold War decade, American policy-makers increasingly viewed impoverished African nations with dysfunctional states as potential breeding grounds for violent extremism. Mimicking American Cold War strategies, they strengthened U.S.-African military alliances and reinforced African security enforcement capabilities. In choosing its partners, Washington focused primarily on countries that were endowed with energy resources or critical to the war on terror—although these countries were often governed by corrupt, oppressive political and military elites. Despite rhetoric that promoted human rights, democracy, and accountable and responsive governance, American assistance frequently strengthened authoritarian, kleptocratic regimes. The failure of the counterterrorism approach was evident when Americantrained security forces targeted political opponents and civilians and staged coups against democratically elected governments. Blowback resulting from governmental abuse and foreign support for unjust regimes sometimes strengthened local insurgencies. After September 2001, the increasing securitization of American relief and development assistance blurred the lines between humanitarian and military endeavors, putting at risk the credibility—and sometimes the lives—of foreign aid personnel.